The MiniDV was the first introduced in 1998. It allows you to record 1 hour of video on a cassette about the size of a box of tic-tacs. 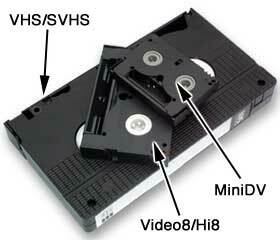 Mini DV tapes are the smallest of the video formats. They take and maintain crystal clear images because of the nature of a digital format. MiniDV tapes record their signal at 525 lines of horizontal resolution, substantially higher than 8mm or regular VHS formats, and due to their higher band width greater color fidelity and detail is possible. The video signal is recorded as DV video which is the same as Digital8. Due to the digital nature of the recording, no signal loss will result from dubbing, so they make an excellent master copy. All MiniDV camcorders have a firewire (also known as i-link and IEEE 1394), allowing easy downloading of the video to a modern computer with a firewire port for editing. Thanks for the last set of tapes you converted for me. I was able to view them along with my family on memorial day, they turned out great! This is another set and am looking forward to viewing them as soon as they're complete. Please send me an e mail with the total cost and I will send the payment.